If you want to obtain a user’s token in a Terminal Server or Citrix session (eg to launch a process in a session) you can call the WTSQueryUserToken function. On the x64 versions of Windows XP and Server 2003 this function fails however and returns ERROR_INSUFFICIENT_BUFFER (“The data area passed to a system call is too small.”) when called from a 32 bit process. Internally WTSQueryUserToken calls the undocumented function WinstationQueryInformationW with the WinStationUserToken class (14) and passing a WINSTATIONUSERTOKEN struct, filled with caller ProcessId and ThreadId. But on x64 Windows the size of this structure is 24 bytes, while on 32 bit Windows the size of the structure is 12 bytes! As you may know, you can enumerate processes of a specific Terminal Server or Citrix session using the NtQuerySystemInformation function. While this works fine on Windows XP and 2003 x86, it fails to work correctly on the x64 versions of Windows XP and 2003 (or maybe even higher). The problem is that RetLength is always SizeOf(SYSTEM_SESSION_PROCESS_INFORMATION) and thus we are in an endless loop! Packaging an ActiveX Component: Easy? Today I needed to package an applications that I was told was very simple. If I hear something like that my first thought is always “hmmm”. So I prepared a machine to build the package and followed the instructions which were to go to a specific URL and download the package (probably an ActiveX control from there). 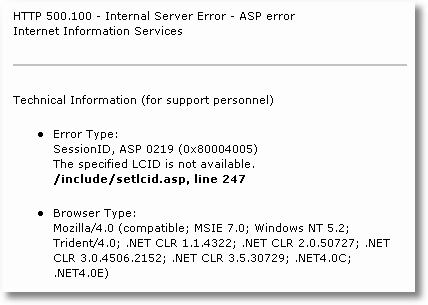 The error message 0x80004005 is not very helpfull since it stands for E_FAIL (winerror.h).